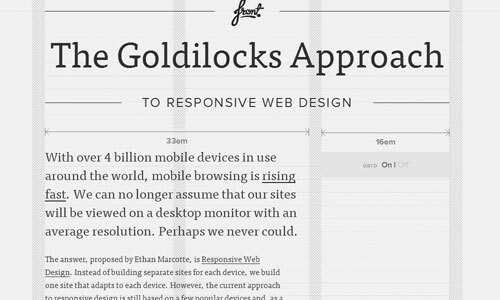 Responsive web design is undoubtedly a hot topic in web design right now. To some degree, the popularity of the concept of responsive web design is well deserved because site users are increasingly diversifying their methods of accessing a website. iPad, iPhone, Android mobile devices, desktops, netbooks — we’re in a time where our web designs must function in a multitude number of ways. 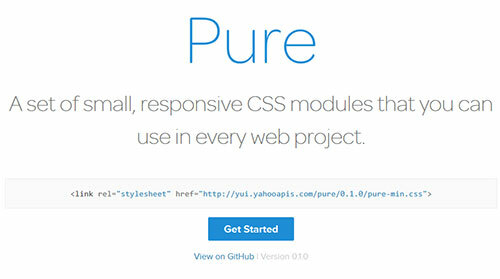 Want to Build a Responsive Website Design? Before attempting to build a responsive website it is a good idea to explore what others have developed. Not sure which framework to pick? Download them all and see which one works the best for you. Learning from the code in action is a good way to get started on your way to creating a responsive website design. 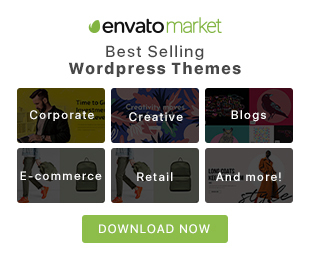 Here are some best responsive CSS grids allow designer and developer to easily and quickly markup and create structured, grid styled websites and layouts. 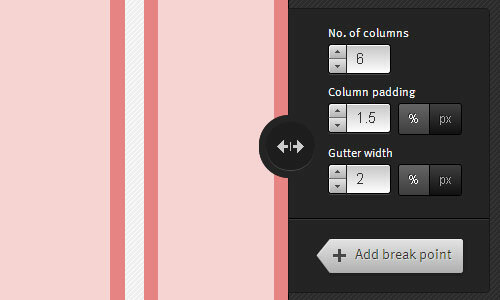 By making use of the power of pre-processors, we can now pass real fractions (or float numbers) as context that generates a percentage based width and gutter for grids. 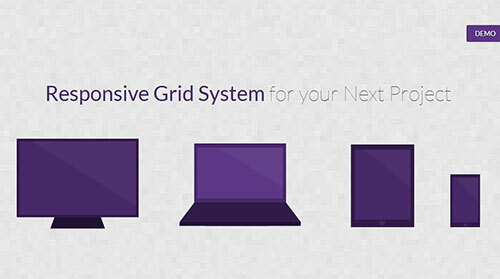 The immensely popular grid-based, front-end framework for web development. An easy to use, powerful, and flexible framework for building prototypes and production code on any kind of device. 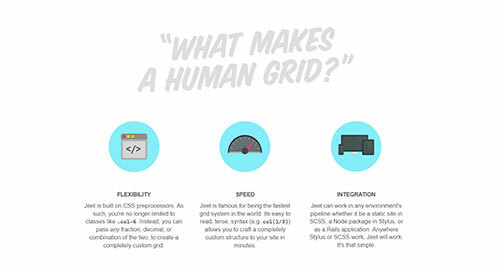 rwdgrid is just another Grid system based on popular 960grid , which is responsive and ranges from mobile, tablet, laptops and wide screen displays. 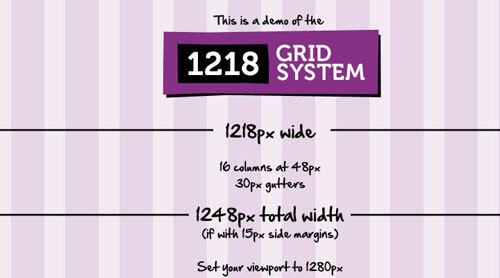 Naming convention of this grid system is similar to 960 grid system, where underscore is replaced by hyphen.rwdgrid is having different Grid system made for 1200px+ Displays, 960px+ Displays, 720px+ Displays and Mobile screens. 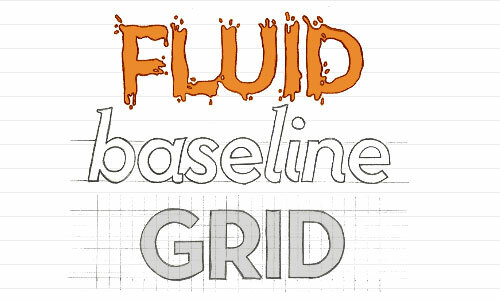 This can be used as a base grid system that will help you to build web design with your existing proficency over popular grid systems. 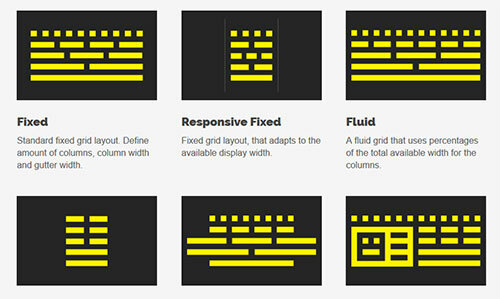 A responsive grid system for fixed and fluid layouts. Built in SCSS, it gives you flexibility and full control. 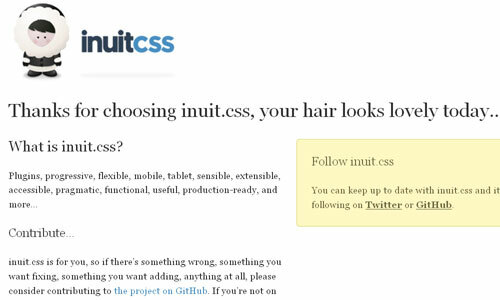 inuit.css is built to work on smaller screens (such as tablets) and tiny screens (such as phones) straight out of the box with minimal effort. 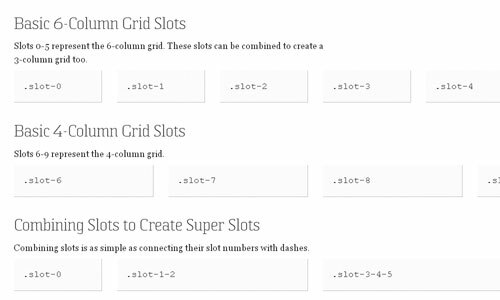 Creating the code for your grid should be the least of your problems when building a site. That’s why SG keeps things simple and straightforward with as little markup and classes as possible. Even nesting grid slots doesn’t require extra classes. 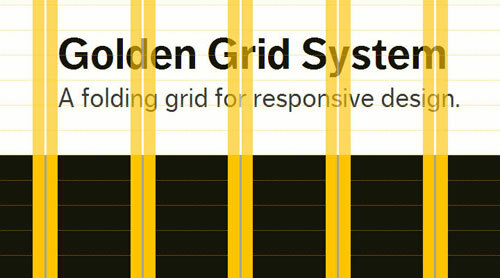 A responsive CSS grid framework, MQFramework utilises the @media property to allow you to design your sites for browsers of all sizes. 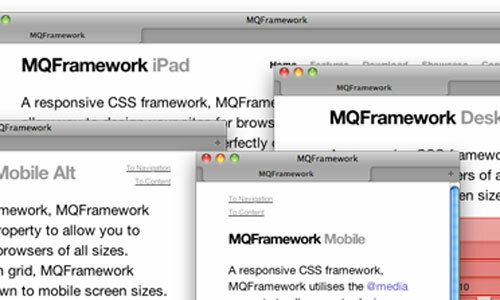 Based on a 12 column grid, MQFramework degrades perfectly down to mobile screen sizes. 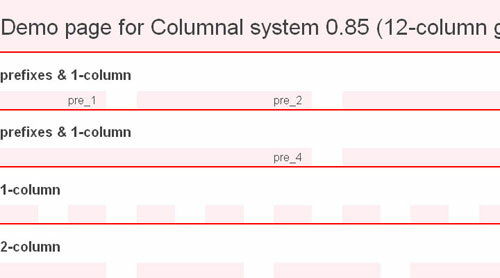 The Goldilocks Approach uses a combination of Ems, Max-Width, Media Queries and Pattern Translations to consider just three states that allow your designs to be resolution independent. 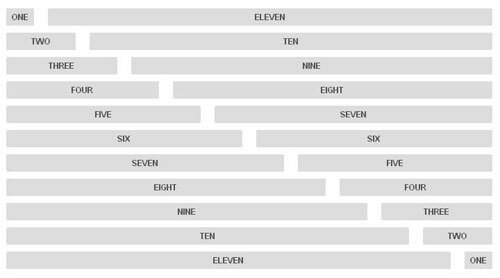 The Semantic Grid System is a fresh approach to CSS grids which allows us to define column-gutter widths, choose the number of columns and switch between pixels and percentages. And all these without the -kinda ugly- .grid_x classes used in the markup. 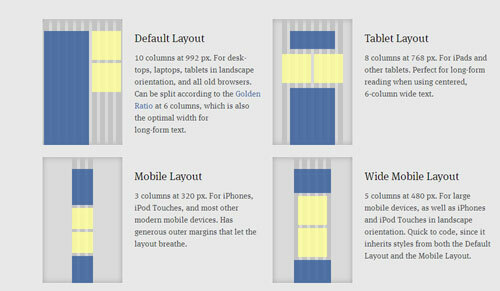 A responsive CSS grid system helping desktop and mobile browsers play nicely together. 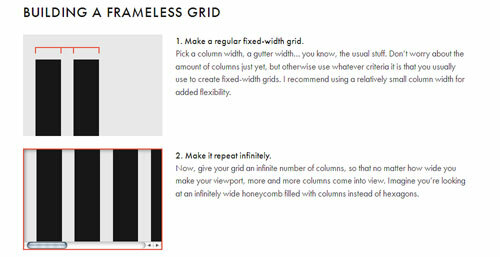 978 is a grid layout system that uses 12 columns at 54px, with 30px gutters. 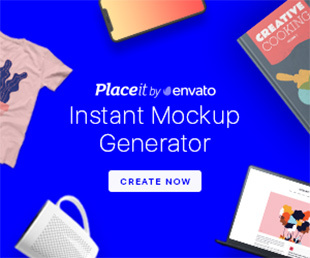 This comes out to a total of 978px, which uses up most of the space on a 1024×768 monitor.